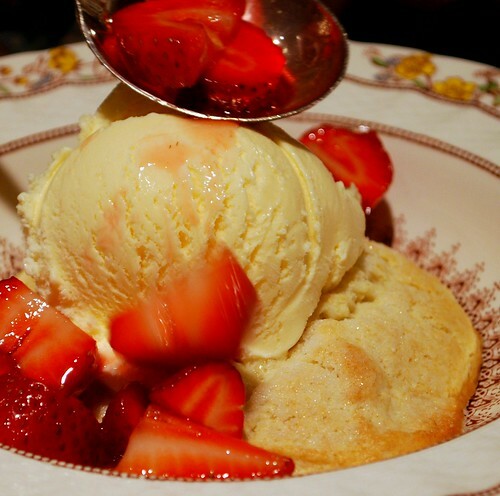 Strawberry shortcake is a sure sign that summer is coming. We had our first of the season the other day at my in-laws’ house, and now I’m completely hooked. Hubby came home with 2 big pints of beautiful strawberries the other day, and I knew I had to request his famous strawberry shortcake. He doesn’t like to flaunt it like I do (ha ha), but he is an amazing baker. This dish has wowed my parents, and several of our friends. And I still never knew the true recipe until tonight!! His family is definitely one for *secret recipes* – that I intend to chip away at over the years to come! 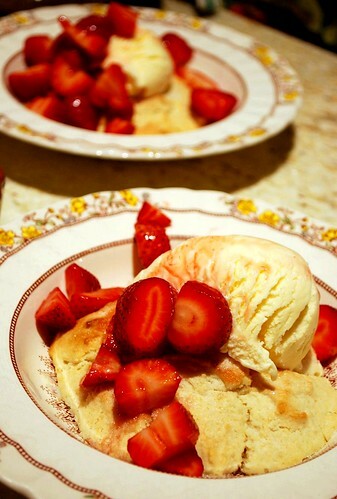 The shortcake is buttery and moist with a crispy sugared top. Delicate and tender, it absolutely melts in your mouth. Throw away your other recipes. This is The One! 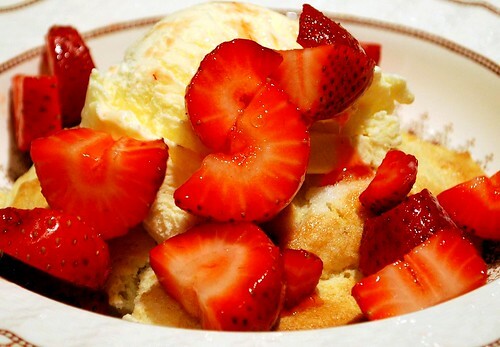 In a medium bowl, mix the sliced strawberries with the 1/4 cup sugar. Cover and refrigerate for at least 1 hour. In a separate bowl, mix the Bisquick, milk, 5 tablespoons sugar, and melted butter until a soft dough forms. Drop by 6 large spoonfuls onto a greased baking sheet. Sprinkle the tops with extra sugar. Bake at 425 until golden brown – about 10-12 minutes.